Some of the most important questions for health policy makers, planners and clinicians have to do with the future. In order to design effective prevention and screening programs, health policy makers must be able to estimate future trends in risk factors for disease and future disease occurrences. Another aspect of thinking about the future is considering alternative or "what-if" scenarios. These scenarios allow policy makers to compare and weigh the benefits and costs of different disease prevention strategies. In general, simulation modelling approaches have been used to describe and model complex systems in the fields of economics, environmental sciences and engineering, and increasingly in health. Specifically, dynamic microsimulation modelling techniques have been gaining traction and have been used to inform policy in relation to complex health and health care system problems in many countries.Footnote 1 In Canada, organizations such as Statistics Canada, Health Canada, the Public Health Agency of Canada (PHAC), and the Canadian Partnership Against Cancer (CPAC) have employed microsimulation models to project future incidence and prevalence of risk factors and diseases, as well as future demands for health care resources. Dynamic microsimulation, in the context of social science and population health, is the simulation of large samples of individuals (micro) and their behaviours, states and actions over time (dynamic). The purpose is to project the socioeconomic and demographic developments of society.Footnote 2 Individuals' behaviours, states and actions are modelled using multiple sources of data including surveys, administrative databases, vital statistics and census data. This technique explicitly simulates individuals and attempts to produce a realistic set of heterogeneous health biographies over the course of an individual's life. For example, within the model, individuals' age, their health behaviours and disease states change realistically and they eventually die. Individual health biographies are summed up to present a projected portrait of the health of the Canadian population. How can microsimulation models be useful as health policy tools? In health policy, prevention and screening strategies have traditionally been evaluated after implementation. This approach is limited because policy makers, who know that large-scale expensive programs can sometimes fail, may be reluctant to implement them despite their potential benefits. In addition, failure or unforeseen consequences of a policy or program may only be revealed after implementation. Microsimulation modelling offers an evaluation method that allows policy makers to examine the results, consequences and benefits of a program in advance of implementation.Footnote 3 Policy makers can also use these projections to build a business case for policy change. At a population level, simulation models inform decisions on prevention and control activities for chronic diseases, including cancer and coronary heart disease. Specifically, they can be used to compare and evaluate a wide range of intervention strategies (including prevention, early detection and screening) and therapeutic options; this helps assess strategies intended to reduce health care costs and improve health outcomes. Below we describe some of the applications of microsimulation models developed at Statistics Canada in collaboration with our partners. OncoSim is a free, web-enabled, empirically grounded microsimulation tool that evaluates cancer control strategies for prevention, screening and treatment. Registered users can create and perform their own analysis by changing input parameters on the website (oncosim.ca). Provincial health ministries across the country have used OncoSim to evaluate screening strategies for cervical, colorectal and lung cancer. OncoSim is led and supported by the Canadian Partnership Against Cancer, with model development by Statistics Canada, and is made possible through funding from Health Canada. OncoSim was formerly called the Cancer Risk Management Model or CRMM. The physical activity model, developed by Statistics Canada, was jointly funded by the Public Health Agency of Canada and Statistics Canada. The POHEM Neuro model was developed by Statistics Canada and funded through the Government of Canada's National Population Health Study of Neurological Conditions. Increasingly, and appropriately, policy makers are required to use evidence-based evaluations of costs and benefits when deciding whether to implement new medical and non-medical interventions. Many of the most important health policy questions—for instance, trends in cardiovascular disease, cancer, dementia, cannabis and opioid use—are challenging to examine, and therefore require robust and comprehensive planning models. Furthermore, Canada and other developed countries are faced with aging populations that will require more health care resources. Population aging and worsening health attributes, like obesity, may be contributing to a rise in chronic disease prevalence and health care system costs. Dynamic microsimulation is a useful methodology for investigating complex health and health system problems; it provides policy makers with a chance to foresee and explore the potential impacts of policy changes. Future work in microsimulation modelling at Statistics Canada will include addressing some extremely complex health problems in collaboration with our partners. For instance, we are currently working to update the way cardiovascular disease—a leading cause of death and disability—is modelled by taking advantage of newly linked data. We have also begun preliminary investigative work to evaluate the feasibility of developing microsimulation models for cannabis and opioid use, their associated costs and potential harms. We also plan to expand our current dementia model to incorporate risk factors like smoking and alcohol intake. Schcofield DJ, Zeppel MJB, Tan Q, et al. A brief, global history of microsimulation models in health: Past applications, lessons learned and future directions. International Journal of Microsimulation. 2018 11(1): 97-142. Spielauer M. What is social science microsimulation? 2011. Social Science Computer Review, 29(1), 9–20. Zucchelli E, Jones A, Rice N. The evaluation of health policies through dynamic microsimulation methods. International Journal of Microsimulation. 2012; 5:2–20. Miller AB, Gribble S, Nadeau C et al. Evaluation of the natural history of cancer of the cervix, implications for prevention. The Cancer Risk Management Model (CRMM) – Human papillomavirus and cervical components. Journal of Cancer Policy.2015 4: 1–6. National Committee on Colorectal Cancer Screening. Recommendations for population-based colorectal cancer screening. Government of Canada, 2002. Coldman AJ, Phillips N, Brisson J, et al. Using the Cancer Risk Management Model to evaluate colorectal cancer screening options for Canada. Curr Oncol. 2015 Apr; 22(2):e41-50. Flanagan WM, Evans WK, Fitzgerald NR, et al. Performance of the Cancer Risk Management Model lung cancer screening module. Health Reports. 2015 May; 26(5). Goffin JR, Flanagan WM, Miller AB et al. 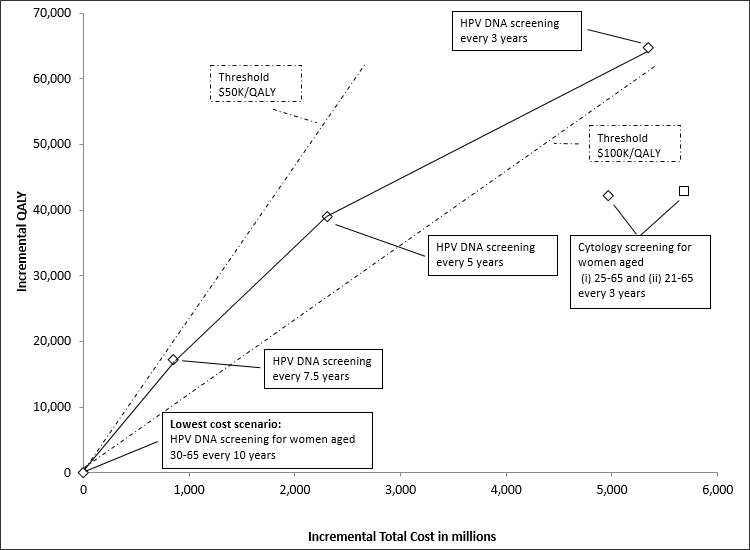 The Cost-Effectiveness of Lung Cancer Screening in Canada. JAMA Oncology; 2015;1(6):807-813. Evans WK, Flanagan WM, Miller AB, et al. Implementing Low Dose CT Screening for Lung Cancer in Canada: Implications of Alternative At Risk Populations, Screening Frequency and Duration. Curr Oncol. 2016 June;23(3):e179-87. Hennessy DA, Flanagan WM, Tanuseputro P, et al. The Population Health Model (POHEM): an overview of rationale, methods and applications. Population Health Metrics. 2015 13:24.